The Instituto Superior de Agronomia (ISA) has its roots in the remote 1852, with the creation of the Instituto Agrícola e Escola Regional de Lisboa, in the reign of Queen Maria II, during REGENERATION, which was directed by Fontes Pereira de Melo. 3. Higher education and scientific, mainly to agronomists, individuals with more comprehensive preparation and with more developed studies, able to direct large farms." The Instituto Agrícola e Escola Regional de Lisboa was opened in the place of the Cruz do Taboado, which was the home to the College of Veterinary Medicine (FMV) (Note: it refers to the former installations of the FMV, in the Street Gomes Freire). A farm was acquired, named “Bemposta”, located about 1 km from the school, where it was possible to make the various practical demonstrations and do some experiments. 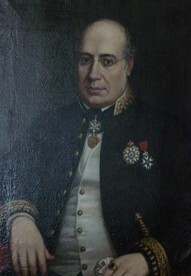 Bernardino Cincinnato da Costa, almost 40 years later, reports "the Instituto Agrícola de Lisboa, was the only institution that the Law of 1852 had created that was still remaining, thanks to the work and superior intelligence of its first director, the most notable Dr. José Maria Grande "(see below, the picture of the oil of Dr. José Maria Grande, painted by J. Santa Barbara in 1862). In order to improve and develop the agriculture, the course of the Instituto Agrícola de Lisboa had four years and included seven subjects. "To the Institute's own subjects other preparatory subjects were added, which were taught in the Polytechnic School: Zoology, Compared Anatomy and Physiology, and Botany and Plant Physiology, in addition to the Drawing of the Year 1, and at the Institute Maynense (SJ): Elements of Physics, Chemistry and Agricultural Geology. Interestingly, the Agricultural Arts - designation equivalent to Agricultural Industries - were integrated into the vast contents of the 7th subject: Agricultural Economics, Administration and Accounting Rural, Agricultural Arts, Legislation and Rural Engineering". In the year of 1864 there was a merging of the Instituto Agrícola de Lisboa with the School of Military Veterinary (near Salitre), which was founded by the Government of King Miguel in 1830 (29-III), thus creating the Instituto Geral de Agricultura. Under this reform, the practical component of agronomy course was carried out at the Granja do Marquês, in Sintra. The reorganization of subjects in preparatory science and techniques, created a first subject, Agrology and Field Crops, and a second that encompassed the materials of Topography, Arboriculture and Forestry. The discipline of Animal Science was created at the time of the foundation of the Agricultural Higher Education in 1852, covering, therefore, the scientific principles which should be based on the exploitation of domestic animals. Throughout the evolution of our Institute until now it has always been realized that the routes leading to the farm animal are inevitably linked to agriculture. With the catastrophic epidemics that occurred in the 2nd half of the nineteenth century, especially the potato mildew (1845), powdery mildew of the vine (1850), phylloxera (1861) and downy mildew of the vine (1878), it was highlighted the economic importance of the protection of plants and research was intensified, acquiring the Agricultural Entomology and Plant Pathology status of scientific disciplines. In the subsequent reform of Emídio Navarro, 1886, the Instituto Geral de Agricultura was renamed Instituto de Agronomia e Veterinária. This reform led to the creation of the 11th subject - Rural Technology and Forestry: analysis of technology products. After pressure from students, teachers and social and political forces, it was created in 1906 "Teaching of Colonial Agronomy", which the Instituto de Agronomia e Veterinária, trough its section of agronomy, has been responsible to administer. After the establishment of the Republic in 1910, the entire education system was transformed. The Instituto de Agronomia e Veterinária is extinguished and replaced by two different institutions: the School of Veterinary Medicine and the Instituto Superior de Agronomia. Manuel Brito Camacho was the Minister of Development of the Interim Government of the Republic, which established the titles of “Agricultural Engineer” and “Forestry Engineer” for new graduates of the Instituto Superior de Agronomia. During the monarchy, these professionals have always been, and continued to be, simply referenced as “Agrónomos” and “Silvicultores”. 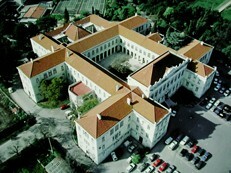 The Tapada, as well as the Ajuda Botanical Garden, were assigned at this time, to the Instituto Superior de Agronomia. It would be inaugurated, seven years later, in the Tapada da Ajuda, the current Main Building of the Institute. The Main Building of the ISA, in the Tapada da Ajuda, designed by architect Adães Bermudez, was inaugurated in 1917. It presents a quadratic structure with cloister with incomplete arches (see photo below). Forestry was first differentiated, in relation to the course of Agronomy, which until then had only single subject of Forestry. This subject was often assigned since the beginning, in terms of accumulation by teachers who made their careers in other areas. It is in this period that there was an extension of the Plan of Studies, with the creation of the disciplines of Forestry and Forest Technology, Forest Economy, Forest Engineering, Torrential Hydraulics, Traffic and Means of Transportation, Aquaculture and Ictiology, Fishing and Hunting, Pastures; although only the first subject had its own professor. The other subjects we directed by professors that were responsible for similar subjects. In 1918, an adjustment of curricula, introduced in colonial agronomy the complementary subjects of Chemistry and Technology Sugar and Colonial Oils. In 1926, the Laboratory of Microbiology “Ferreira Lapa” was created, where studies of products and technologies in which microbiology plays a major role we conducted. It was only in 1930 that the Instituto Superior de Agronomia, achieved university status, with the creation of the Technical University of Lisbon, where it was incorporated, along with the Schools of Engineering, Veterinary Medicine and Economics. Francisco Caldeira Cabral, graduated in Landscape Architecture from the University of Berlin, started in 1942 (14-IV) the course of Landscape Architecture in the Instituto Superior de Agronomia. Thus, a new profession, unknown in Portugal, was created. In 1952, a century after the onset of the organisation of agricultural education, in response to developments in the field of science and technology of food, the curricula of ISA were subject to profound changes. It was recognized the need to differentiate the course of agronomy in four branches: Agriculture and Animal Husbandry, Plant Pathology, Rural Economy and Agricultural Industries. There is thus the will of granting greater emphasis on education in food science, in parallel with the policy of agricultural education in other European countries. Later, with the Regulatory Decree No 53/79 of 11 November, and by Decree-Law No. 128/81 of 21 October, the Instituto Superior de Agronomia granted four degrees: Agricultural Engineering, Forest Engineering, Industrial Engineering in Agriculture and Landscape Architecture – maintaining, however, the degrees of Tropical Agriculture and Tropical Forestry. The reform of 1979 removes the option of agricultural industries, in the course of agronomy, and creates a degree in Industrial Engineering in Agriculture. In creating this degree, in the words of Pereira and Santos, "there is an implicit recognition that agriculture is losing the historical monopoly of the single source of supply of food, to be gradually integrated into a broader area: the Agricultural Industry". In 29 September 1986, by Decree-Law No. 327/86, the degrees offered by ISA were changed in order to meet the requirements coming from the scientific and technological development of the topical areas of activity. In 15 June 1989 the new plan of studies was approved by the University Rector. In the wake of Law No. 108/88 of 24 September, which establishes the autonomy of the universities, the Statute of the ISA was promulgated on July 4, 1990. This constitutes an important milestone and a valuable means for promoting the progress of this School. Its logo, representing an eagle sustented on the motto Hinc patriam sustinet (those who feed the homeland), support the vision of the inovation, the knowledge and the role of the university in modern society. This Latin expression is taken from "The Georgics" of Virgil.